Where should denture teeth be placed? Should permanent dentures (all on four) be placed with the anterior teeth 2 to 3 mm from the gum line or should they follow the gum line? Is this a common procedure or the dentist’s choice? I have bulky lips as a result. I think we have a terminology problem. The word gumline refers to the edge of the gum where it meets the tooth. When the teeth are extracted, there is no more gumline. If the teeth are replaced with a complete denture, then the gumline would refer to the edge of the pink acrylic on the denture where it meets the false tooth. So where the teeth are placed defines the gumline, making it impossible to place the teeth anyplace else than right at the gumline. I think what you are talking about is the placement of the teeth in relation to the ridge of the jawbone under the denture, so let me address that. 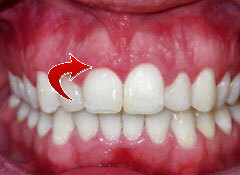 When you get a complete removable denture, the front lower teeth should be placed directly over the bony ridge. This is important for the lowers particularly because if they are too far forward, the denture will tip up in the back whenever you bite anything with your front teeth. In your case, however, you are talking about an All-on-4 denture, which is implant-retained. An implant-retained denture isn’t going to tip when you bite. And then you are saying the teeth are only 2-3 millimeters from the ridge, which isn’t much. That is close enough to be within range even for a removable denture. So their placement sounds fine from the point of view of being able to chew. However, there are other considerations in the placement of the teeth, such as the appearance of your lips. What should be done, with quality dentures, is there should be a wax try-in of the denture before it is made in acrylic. When I made a set of dentures, I would always have the teeth set up in pink wax on a plastic plate made to fit the patient’s mouth. With this wax try-in, I would evaluate the appearance of the teeth, the patient’s speech, fullness of the lips, vertical dimension, and bite to make sure everything was correct before the denture was processed. If your denture is already made, there may still be an easy remedy. If your implant-retained denture is made so that it is attached to the implants with screws, it can be removed and teeth re-set. It isn’t that difficult a procedure to have the front teeth drilled out and re-processed into the denture in a new position. Some dentists might even do this for free, but I suspect that many would charge some for this revision after the denture is made. But it shouldn’t be expensive. My teeth are crumbling, and what if I can’t afford any other treatment but dentures? I am considering getting full dentures. I was told I had little enamal left on my teeth about 13-14 yrs ago and since have had two pregnancies in which I vomited every day(sometimes multiple times a day) during my entire pregnancy. Since the birth of my last child 8 yrs ago my teeth have literally started crumbling like powder,cracking and I have a lot of visible cavities. I had a tooth removed last week because it had already started falling apart and I cracked it in two blowing up a float for my child and I had flat out had enough. Five of my teeth are literally down to the gum line now and one crown and post have fallen out. My dental insurance only covers $1000 a yr and it doesn’t take much to use that up so if you are wondering why I have not had all this fixed as it happened when you run out of insurance in March it is hard to get anymore done with insane cost of cosmetic dentistry. It will only cost me $1400 out of my pocket to get upper dentures (I am still debating on lowers as they are not as bad as the uppers) but I was quoted about $4000-$5000 out of pocket to get root canals and crowns or bridges. I do not qualify for any loans or assistance to get this done so dentures appear to be the only option. I have read just about everything you have on this site and am really irritaed at your comments about peoples care or lack of care for their teeth as you do not know ! what som e have gone through. I also had meningitis as a baby and was put on alot of meds( I have other health issues due to this but my teeth are the worst). I would love to have an awsome cosmetic dentist fix my teeth right but unless you or they intend to do it for free I think you need to stop being so condecending about what people should do and/or what caused their teeth to become bad in the first place. In case you are wondering I have brushed after every meal and snack since I was a kid and flossed at least once a day as well as rinsed with a mouthwash but it has done me no good except to ensure fresh breath. It sounds to me like you’ve almost completely decided what you want to do, so I don’t know that you need much help here, but I’ll offer some. I was also intrigued by your comments and wanted to respond to them. I think you’re trying read things into my website that aren’t there if you come away from reading it thinking that I would condemn someone like you in your situation. I don’t know where you would get that. Yes, I’m going to tell people to take care of their teeth when they can. To do otherwise would be negligent. But I rarely criticize patients who write to me with their problems. And then there are always things that can happen that are difficult or even impossible to deal with, which sounds like what you have experienced. If your finances are really limited, it may be that dentures are your only option. I saw a number of patients in your situation and did my best to help them as much as I could. But don’t expect me to sugar-coat your situation. There are troubles ahead when you get full dentures. They will reduce your chewing efficiency, and there is a great deal of dissatisfaction out there with people who have dentures. In addition, your jawbone will begin to shrink and within about twenty years or so, you will have to deal with facial collapse. But let me try to be helpful, and share some ideas that may be helpful for your situation, because you are in a difficult situation. Losing your lower teeth is much more serious than losing your upper teeth, and an upper denture is much easier to adjust to and to use than a lower. An upper denture is held in place with suction, so it is considerably more stable than the lower denture, which rests and kind of floats on your lower jaw and is held in place by your tongue and cheeks. Additionally, if you have lower teeth chewing against an upper denture, it may help the lower teeth to last longer. So if you are looking for the most economical solution and you can keep your lower teeth, any amount of time you can keep them will delay facial collapse. And there is much more satisfaction with upper dentures than with lower ones. Also, any teeth that can be saved for any amount of time will delay the bone resorption. Sometimes the crowns of the teeth can be cut down and the roots of teeth can be retained and this will also delay the bone resorption. I hope that you can find a sensitive and caring dentist who will take care of your needs and take the time to discuss your options. Several years ago when you were in Cedar Rapids, you fashioned a beautiful upper denture for me. That was shortly before you moved to Colorado. Well, needless to say, a number of years have passed and I was in need of a new denture and despite paying an arm and a leg for a new denture that my regular dentist assured me would be done to my specifications and satisfaction, my mouth is extremely uncomfortable and I am unhappy. The appearance is much less attractive and even though I kept insisting on “more tooth” I feel like I have old person dentures. I have considered implants but the cost is more than I can absorb. In my search, I ran across your website and blog. How I wish you were practicing in the area again because I know I would be happy with the end result. Can you tell me what you think about the all on 4 one hour implants? They are very costly but are they a good option? Can you recommend an implant or cosmetic dentist in the Chicago area? I’d love to hear from you and get your advice and opinion. Yes, I remember you. I was quite flattered that you drove all the way from Chicago to see me. I hope everything is going well for you otherwise. When I was in Iowa, I used to drive to Chicago for my own dental work and see Dr. William Cohen, who practices in the northern suburb of Glenview. He is very nice, a terrific cosmetic dentist, and can work with you for dental implants. His fees are reasonable, and he does a lot of work with dentures and dental implants. I wouldn’t recommend the all-on-four technique. It’s kind of risky. I would check with Dr. Cohen. He would be straight with you and would be willing to discuss all of the available options to help make this affordable. Will my medical insurance pay for my dental implants? I have some dental issues with my upper teeth, missing three back teeth and have one bridge that is 37 years old. I would like to have all my upper teeth replaced with permanent denture implant. I have struggled with peridontal disease and go in every six months for scaling/root planing. I did try a partial dental plate but it made me gag, and I could never get past that or trying to eat with it in. I would like to get an estimate for this if it can be done and it could be considered a medical condition so that my medical insurance would help pay for it. That’s a point that we don’t mention maybe as often as we should. One distinct advantage of dental implants over say a removable partial denture or a complete denture is that there is no extra hardware in your mouth, and people who are prone to gagging can sometimes have great difficulty with a plate, say, that goes across your entire palate as many dentures need to have. As far as your insurance, your medical insurance won’t likely cover anything, so you will need to go to your dental insurance for any help. We get variations of this question a lot – “My teeth are affecting my general health, so can’t I expect my medical insurance to help pay for it?” But almost all medical insurance contracts have an exclusion clause that specifically denies coverage for any dental problems. Otherwise, even a simple cavity could be called an infection and it does affect your general health. The only exception is that medical insurance will generally cover dental damage from an accident. So if you break your front tooth diving into a shallow pool, medical insurance will generally help you pay for it. Otherwise, anything done to your teeth will be excluded from being covered by medical insurance. We can’t give estimates for specific dental work. For that you need to consult a local dentist. We do have a page on dental implants cost to give you some general guidelines. I can’t keep my denture in. What can I do? I am a 60 year old woman who has a denture for about 35 years , I can hardly keep a denture in even with adheasive I am told i have virtually no ridge left and it could get bad enough that i can’t wear a denture at all. what can be done? You are in a very tough spot. What happens is that when your teeth are gone, your body thinks it doesn’t need that bone any more and begins to resorb it and use those minerals elsewhere in the body. It’s called facial collapse. Eventually, it does get to the point where you can’t even wear a denture. At that point, what you need is bone grafting to build the bone back up. And you may need to hunt around to find a dentist who can do this. This type of surgery is complicated and difficult, and there are oral surgeons who won’t attempt it. Beyond that, there are a number of options for getting replacement teeth, depending on how important this is to you and how much money you want to spend and how much treatment you want. The simplest thing would be to just have the same kind of removable dentures placed over the newly built up jawbone. The problem with that is that you will go back through the cycle of bone resorption again. The placing of dental implants will prevent bone resorption around those implants. The more implants you have, the more bone you will retain. You could have just two dental implants in each jaw and have what are called overdentures or snap-on dentures over those. That works reasonably well. Or you could have dental implant hybrid restorations where the dentures are securely fastened to the implants, but that will cost a lot more. Another economical choice is mini implants. And what I would hope is that others would learn a good lesson from your story. It would have helped if, when you were twenty-five years old and possibly were tempted to think that getting false teeth would be the end of your dental problems, if someone had explained to you the long-term consequences of getting all your teeth extracted. So let your children and all your friends know of your difficulty, if you can feel comfortable doing that. For those who have lost all their teeth but don’t yet have the bone resorption to the degree you have, placing dental implants can prevent these other problems down the road. Does anyone make an upper denture that has a “soft or flexible/pliable” feel? I hate the hardness in the roof of my mouth and the artificial feel. When I refer to “soft dentures” I am meaning dentures with a soft lining. Many dentists are offering that in cases where patients have bony “bumps” along the bony ridges of their jaw that would easily become sore if the denture fit closely to those places. They are more comfortable, but they’re more expensive, don’t last as long, and are a little more trouble to keep clean. But I’m not aware of anyone that is making a pliable complete denture that doesn’t have a hard surface over the roof of your mouth. A complete denture needs some firmness to its framework in order to fit right and to give a solid feel when you chew. Your solution would be to go to dental implants. A hybrid implant restoration completely eliminates the part that goes over the roof of your mouth, because the teeth are completely supported by dental implants. It costs more money, but it completely restores your chewing efficiency, it feels like your own natural teeth again, and it prevents the facial collapse that is inevitable with complete dentures. Should my son have all his teeth extracted? My 22 y/o son is a recovering drug addict whose teeth have been destroyed. His dentist recommends extracting 27 teeth at one time and replacing with dentures. Is this a lot to do in one visit? Aren’t dentures custom fitted? I know this is probably the best route to take for him and he is ok with this. Right now he only has his front teeth to chew with. Thank you. I am not in favor of this treatment plan. It’s easy for the dentist and a lifetime of difficulty for your son. Twenty-two is way too young to be getting all his teeth extracted. Once the teeth are extracted, your son’s jawbone will start to shrink, and will continue to do so for the rest of his life. By the time he is 40 he will be a dental cripple, unable to comfortably retain any kind of a removable denture. His face will shrivel up and he will look much older than his years. He will be wanting expensive and complicated bone grafts to his jaw to try to get to some level of function where he can eat normal foods. By the time he is 60 it will be much worse. Surely, out of those 27 teeth, there are some that can be saved. Any that are saved will help preserve that jawbone. Yes, it is more bother for the dentist and it will be more work for your son to maintain those teeth. But it is well worth it. And, if there are none that can be saved, placing some dental implants will do the same thing as far as helping prevent the shrinkage of the jawbone. Even two implants per arch will help preserve his bone, though more would be better. It’s easy to look down on your son and say, “Drug addict – not worth the trouble.” And he may well have similar feelings about himself. But I would hope for better things for him. As far as the number of extractions, that is a little much for one sitting, in my opinion. The amount of novocain required to extract all the upper teeth in one sitting is pretty large, and that can be a significant risk factor, in addition to the amount of trauma from all those extractions. The lower jaw can be completely numbed with two main injections, but the upper jaw requires multiple injections. If I were in your shoes, I’d go dentist shopping. Dentists have to pass minimum competency examinations, but there is no examination for caring. Find a dentist who gives you a feeling that he or she truly cares about your son and his long-term future, and that will greatly improve your chances of getting good care for him. Thank you so much for your reply – I really appreciate it. My son is the most important person in the world to me and if I was financially able I would have his teeth replaced with implants. I will accept your advice and get some other opinions. I am not an expert but I too thought this was an extreme treatment plan. Immediate dentures are placed the same day as teeth are extracted. They require relining a few months after being placed. Dentures that are made with special attention to their appearance are sometimes called cosmetic dentures. Soft dentures are made with soft linings for a more comfortable fit and sometimes a more snug fit. I’m getting dentures. Do I go to a general dentist or oral surgeon first? I am a 50 year old man who grew up with a fear of dentist. At an early age I was “freaked out” by a dentist and never really wanted to go to them – unless it was to have a tooth pulled. Now that I am older most of my teeth are broken or missing. I need to get dentures – my question is how do I know if I need a dentist or an oral surgeon to remove what teeth I have left? This is rather embarassing for me and it keeps me from a lot of activities involving my daughter because of the embarrassment. Can you tell me which I should look for so I can have my teeth fixed and once again be able to smile in public? Thanks in advance – I would appreciate the help. I would go to a dentist who can do the tooth extractions – the surgery AND do the dentures. 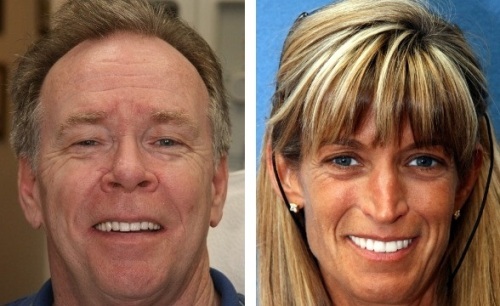 Doing pre-denture surgery isn’t complicated, and there are many general dentists who do it. Just call the dentist’s office and ask what the dentist USUALLY does. Don’t give any hint as to your preference before you ask the question. You just want to find out how the dentist usually handles cases like that. A dentist who usually does the surgery, too, will have plenty of experience at that. And since you have this dental fear you talk about, you’ll also want a dentist who offers sleep dentistry. In Ohio that shouldn’t be a problem, as there are a number of dentists there who do sleep dentistry. The reason is that there is a certain amount of coordination that is needed between the surgery and the denture. You may, for example, choose to have the denture placed the same day as the teeth are coming out. This is called an immediate denture. This eliminates the embarrassment of going for six weeks or more without any teeth. Even if you don’t do that, there are certain things the dentist can do during the surgery to help the dentures fit better and be more comfortable, and general dentists are more familiar with those things than oral surgeons. But even if you did have an oral surgeon take out the teeth, you’d still want to go to the general dentist first, because the general dentist will coordinate the procedures.